With the help of a $50,536.90 grant from the Federal Highway Administration’s Recreational Trails Program through the Louisiana Office of State Parks, New Orleans City Park is working to upgrade its bicycle infrastructure to meet the recreational and transportation needs of the community. Bike parking has been installed in 15 locations throughout the Park with the capacity for over 100 bicycles. Visitors can bike to a wide number of locations, find secure parking for their bicycle, and then engage in a number of activities from visiting a playground or riding in a paddle boat to running around the practice track or exercising on the outdoor fitness equipment at the Festival Grounds. In addition to bike parking, a self-repair bike center featuring an industrial tire pump, repair stand, and tools is located at the entrance to Couturie Forest (1009 Harrison Avenue). Currently, bike trails exist along Wisner and Robert E. Lee Boulevards, as well as the Harrison Avenue bike path that directly connects with this project. Additionally, a bike path for Marconi Avenue has been awarded funding from the Transportation Enhancements Program. This project will greatly enhance the Park’s extensive bicycle trail system, facilitating greater community usage and opportunities for active transit. This project is slated to begin later this year. WHAT THE’RE SAYING: “City Park has miles of beautiful bike roadways and trails. The new bike racks will allow bikers to explore the Park more fully,” said John Hopper, Chief Development Officer. Click here to find out about bike rentals at City Park. What’s With the Marconi Bridge in City Park? This post originally was posted here. The old train overpass on Marconi Drive used to have beautiful irises painted on it. Now they are faded and there's graffiti and big gray squares of paint. Who painted the original bridge and can they do it again? You're not alone in your curiosity about the Marconi Drive railroad bridge. In fact, we heard from reader Raymond Stelly a few days after you wrote, asking the same question. That's probably because the bridge is in such a high-profile spot, seen by thousands of people traveling through New Orleans City Park each day. The history of Marconi Drive itself dates back to March 1937. Like many park improvement projects of the time, the construction was a product of the federal Works Progress Administration. New Orleans Mayor Robert Maestri cut the ribbon on the new thoroughfare on April 13, 1938. It is named for Guglielmo Marconi, the Italian inventor widely known as the father of radio. The railroad underpass, which The Times-Picayune reported was built at a cost of $760,000, was dedicated in June 1953. The irises and pink and gray color scheme you recall date to the 1980s, when then-Orleans Parish Criminal Sheriff Charles Foti's prison art program repainted the underpass. The program began in 1984, when inmates helped paint Christmas murals on the old Orleans Parish Prison. Their work gave a fresh new look to dozens of structures over the years. Longtime Foti spokeswoman Danae Columbus could not recall the exact year the Marconi bridge was painted but said inmates initially repainted the entire bridge, then came back and added flowers. Recent activity you may have seen at the underpass has less to do with its look and more with safety. WWL-TV reported that after at least five instances of 18-wheelers crashing into the structure, city crews have installed warning signs and safety mechanisms to prevent future accidents. As for a new paint job, the underpass is owned and operated by the railroads, so any decision to repaint it would be up to them. The Carousel is often called the ‘Flying Horses’ by New Orleans locals. The Carousel is the oldest ride in the Hines Carousel Gardens Amusement park. It dates back to 1906 but some of the animal figures date back to 1885. The Carousel was originally located on a track of land along City Park Avenue. The Carousel was moved to its current location in 1928, creating what would eventually be City Park’s Amusement Park. The Carousel has had a few owners in its history including Harry Batt, Sr. Locals may remember Mr. Batt from Pontchartrain Beach. In the late 1980s, William B. Hines loaned Friends of City Park $300,000 to purchase the Carousel from Harry Batt and an additional $50,000 to renovate the Carousel. (Eventually, Mr. Hines forgave all loans. The William B. Hines Carousel Gardens Amusement Park is named for him). -The animals were carved and hand painted by Charles Looff and Charles Carmel. -The Looff animal figures contain faux gem stones and are the older of the two types of animals (older than the Carmel animals). -The animals are loved so much by visitors they need repainting every year to 2 years. They are still hand painted. -The Carousel contains fifty-six animals. 53 are horses plus a lion, giraffe, and camel. There are also 2 chariots for riding. -The horses have real horse hair tails. -Thirty of the horses move up and down and are called ‘flyers’ (thus the Flying Horses nickname). -The Carousel still uses the original motor. -The circular platform on which the animals ‘ride’ is suspended off the ground by 40 metal rods. -The lion weighs 500 lbs. Travel around New Orleans City Park this summer and you’ll be looking for some shade to rest underneath. At the New Orleans Botanical Garden – they deliver shade! The raised beds in the Southern Shade Garden is beauty in motion with shade loving plants such as Hydrangeas, Azaleas, numerous species of ferns and several shade loving groundcovers. Tree Ferns (Cyathea cooperii), with their spreading fronds, make striking architectural focal points along with several varieties of Japanese Maples (Acer japonica). Impatiens and Caladiums make a vibrant appearance during their annual growing season. Enjoy the delicate fragrance of Sweet Olive (Osmanthus fragrans) while swinging on one of our colorful swings under the Live Oaks. The Garden is also filled with art. But today we’re looking for shade art. The next few photos show the Garden’s residents (the plants!) throwing some shade on the ground and looking good doing it. The last entrance time is a 1/2 hour before closing. The entrance to the Garden is on Victory Drive in City Park. Ample free parking is available along Victory Ave. and in the lot across from the Garden. The new Sir Cumference playground had a soft opening today at the Park. Like a fresh pizza coming out of the oven, it didn’t take long for kids to find it. really fun musical instruments (think chimes and marimbas). 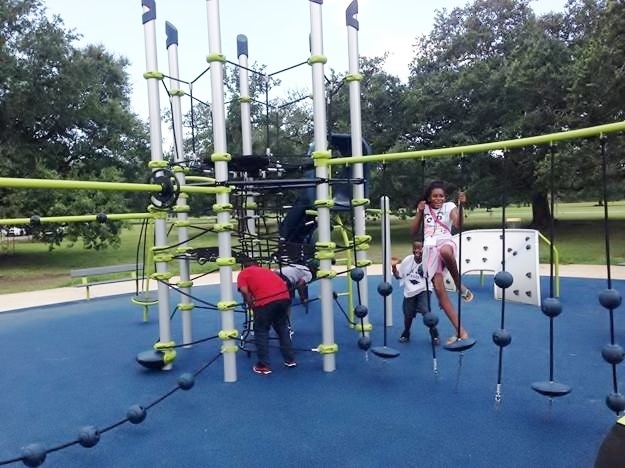 The playground is geared to children ages 5-12. It is located at the Festival Grounds. Down the road we’ll have an official dedication of the playground.